Capnographs measure the concentration of carbon dioxide at the end of each exhaled breath – defined as end-tidal CO2. 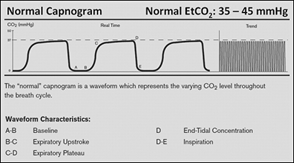 Read about capnography in emergency medicine and how to monitor critically-ill patients, procedural sedation, cardiopulmonary resuscitation and transportation of ventilated patients within and outside the Emergency Department. Most life-saving articles of 2014? Of all the articles of importance in emergency medicine in 2014 Medscape has selected the five that could have the greatest impact in helping you save lives. Make sure you read them! sustained ventricular tachycardia or ventricular fibrillation (excepting patients with serious comorbidities or contraindications to such procedures). Such patients have been given a Class I indication, level of evidence A, for invasive therapy within 2 hours. Note that immediate catheterization is now indicated for patients who are post-ventricular fibrillation cardiac arrest even in the absence of ST-segment elevation on the ECG. Cardiac arrest victims who present with pulseless electrical activity (PEA) usually have a grave prognosis. Several conditions, however, have cause-specific treatments which, if applied immediately, can lead to quick and sustained recovery. Current teaching focuses on recollection of numerous conditions that start with the letters H or T as potential causes of PEA. This teaching method is too complex, difficult to recall during resuscitation, and does not provide guidance to the most effective initial interventions. This review proposes a structured algorithm that is based on the differentiation of the PEA rhythm into narrow- or wide-complex subcategories, which simplifies the working differential and initial treatment approach. This, in conjunction with bedside ultrasound, can quickly point towards the most likely cause of PEA and thus guide resuscitation. A randomized trial of protocol-based care for early septic shock (Full-text available here) and Early goal-directed resuscitation for patients with early septic shock (Abstract available here. Full text available from the library on request. Use the request form here). Central venous catheters and monitoring ScvO2 do not appear to improve outcomes when used routinely. Rather monitoring serial lactate levels as a measure of perfusion appears to be adequate in general. Blood transfusions should be used less often and are best saved for patients with active cardiac or cerebral ischaemia in the presence of a haemoglobin level < 7 g/dl.